Can someone say “Polar Vortex?” Sheesh, what a week last week! Now that much of the Midwest is preparing for more unpredictable weather, Lawn Pride felt it was a good time to share some smart tips for tackling snow and ice without overdoing it. So your driveway is covered in snow and you have somewhere to be. Before you throw on a coat over your pajamas, grab the shovel, and run outside … STOP! 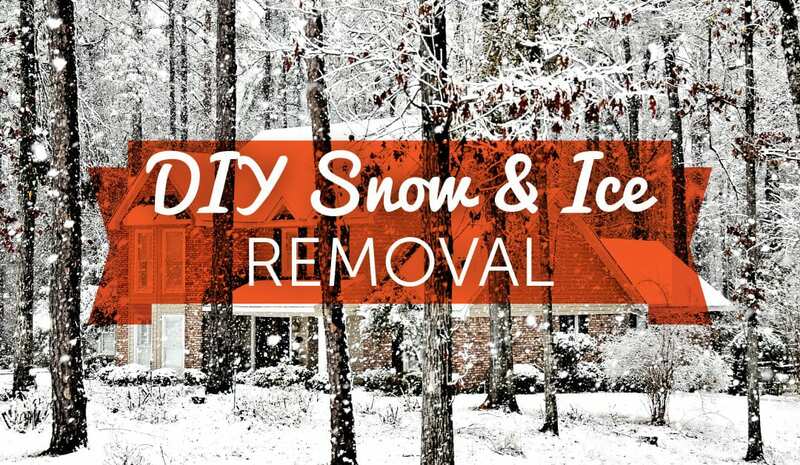 Snow removal isn’t easy work, so a bit of preparation goes a long way in keeping you safe. Staying up to date with the local forecast is always a good idea. For example, if you know it’s supposed to snow tomorrow, get a jump on the weather and spread salt around your sidewalk and driveway today. After the snow falls, gear up by dressing warmly, especially with regards to your head, hands, and feet. Wear layers in case you start to sweat or overheat while shoveling. Stay hydrated and take frequent breaks. If you don’t have a snowblower, invest in a quality ergonomic shovel, and remember – lift with your legs, not your back. If you run into ice, a sprinkling of sawdust or kitty litter can help improve traction. And if you start to feel exhausted, stop what you are doing. Work smart, not hard! Melting snow on the roof may freeze at the edges, causing potentially damaging and dangerous ice dams. If you’re up to the challenge, here’s what to do. For a flat or gently sloping roof, use a shovel if it’s safe to do. Otherwise, pick up a roof rake from your hardware store, and carefully remove the last couple feet of snow from the roof’s edge. Fill nylon pantyhose with calcium chloride deicer. Be sure NOT to use regular rock salt (sodium chloride), as this can damage your roof and gutter! Cover any grass or plants under the gutter with tarps. This will help protect vegetation from being damaged by the ice melt. Place the pantyhose vertically across the ice dam. This will help melt a narrow channel through the ice. Again, be careful while doing this. Keeping your gutters clean and your roof free of accumulation after snowfalls will help prevent ice dams from forming. Rock salt is one of the oldest and most reliable deicers on the market, but it’s not without its problems. Salt can damage and kill grass and plants. It can burn pets’ paws, and they are also attracted to the taste, which can make them sick if they ingest it. Snow-melt washes salt into our storm drains, which can kill aquatic life in creeks, rivers, and lakes. It’s also corrosive, and can cause premature rust on your vehicles and other metal objects. All of these problems are multiplied when salt is over applied. You don’t need to coat your driveway with the stuff for it to be effective. Follow the mantra “less is more” and pay attention to where you apply it, being mindful not to spread salt on or adjacent to your yard. Snow and ice are just a part of winters in Indiana. For more tips and tricks on year-round yard care, connect with the pros at Lawn Pride.